Bonc yr hafod Country Park Country ParkBonc yr Hafod, Hafod Community Park is situated on the former Hafod spoilheap. Thousands of trees have been planted on the site to make Hafod one of the largest community woodlands in North East Wales. Hafod covers nearly 90 acres and includes a large hill, known locally as picnic mountain. A network of paths take you to the top of the hill where there are spectacular views of the surrounding countryside. On a clear day the views extend to the Peak District. 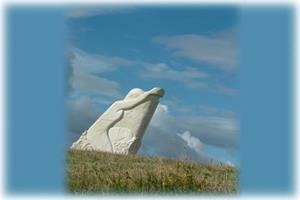 A sculpture celebrating the changing uses of the land can also be seen at the top of the hill. Made in the form of a sundial, changing through time, the sculpture is a memorial to the miners of the area as well as depicting the wildlife that now inhabits the park. A designated Site of Special Scientific Interest, the area has several ponds that provide a home for the endangered Great Crested Newt. It is also home to the skylark, which is threatened with extinction, but Hafod provides the perfect habitat for its survival. Hafod can be found by taking the Plassy turning off the A483 and heading towards Johnstown. Take the first turning right for 'Denis of Ruabon'. The Hafod car park is a little further along on the left.